Grand Theft Auto V from Rockstars Games is one of the most anticipated games of the year; heck of this decade yes i know it just started but that’s how big this game is. 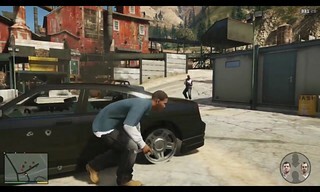 The company release a video yesterday showing off the game play along with showing us around Los Santos: The setting will be a California base city simply known as Los Santos in GTA land. GTA IV was in New York well GTA V is returning back to California; where we will see beautiful cars; from Audi to Pagani. The game well be free flowing meaning you can do anything and everything you do in the real world today. Rockstars made it a little bit more special from the pass GTA; it was a must have. You will be able to go hunting for animals; buy cars customized them; play sports like golf and tennis. You can fly planes drives expensive boats; get tatted anywhere on your body, workout go diving and see the world that most of us don’t get to see!